The road tips to the right. The lanes diverge. The KIA SUV plunges into a tunnel comprised of trees and shrubbery, lit only by its headlamps. 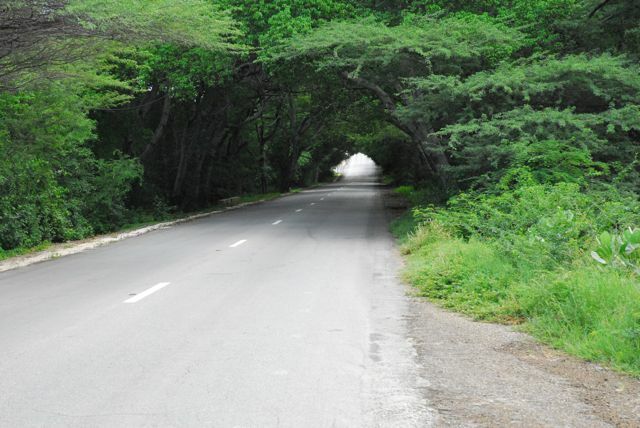 Curaçao’s hot, humid, tropical air rushes through the half-open, driver’s-side window. Cool, air-conditioned air blows on us from the dash. I love the hot air rushing across my face as we drive through the island night. “Was that Barber?” I ask. “No, I didn’t,” comes her reply. “Not really. Some place along here, I think,” Char says, sweeping her pen in a large elipsis over the road map. Effective signage on this 38-mile strip of land just 35 miles north of Venezuela is noticably absent. Especially at night. Especially when you’re trying to find a hotel 18 miles from the airport. Char punches the dome light off. I drive on. My angst ticks up a notch. The disconcerting feeling of uncertainty about being able to find Lodge Kura Hulanda does not abate. I had cleverly written to the hotel for directions prior to arriving and so paid little attention to the car rental clerk when she provided hers. The hotel had made it sound simple: Exit airport, follow signs to Westpunt; At round-about, turn right, follow signs to Westpunt; At Barber Village (first Cemetery), follow signs straight to Westpunt; At second cemetery, turn right, follow signs to resort. Cemetaries were evidentally important landmarks; unfortunately for us, they were invisible in the unlit night. The foliage of our natural passageway now gives way to the open night road like a subway tunnel to the open-air train track. For whatever reason, I imagine a deer leaping in front of the car lights, not an uncommon event on many roads in United States. Not here, I realize. Not 12 degrees north of the equator. Godzilla, maybe, or some other lizards, but not a deer. If anything, for sure, it would be an iguana—like the one that would eventually sit on my head. It’s 10 p.m. Car lights behind us now. Following. Been driving for about 30 minutes. We come upon a cluster of buildings, but we move quickly through them. A grocery store. An ATM machine. A small sign nailed to a stick stuck in the ground: Lodge Kura Hulanda! Whoa! I can’t stop in time, but I pull off the road sharply and stop just beyond. I turn the car around. I turn down the dark street. Another sign. Another street. Finally, on a wall, I see the resort’s name. I drive up to an electric gate. A guard pushes a button. Voila! We suddenly find ourselves driving on a paver stone driveway that curves through foliage up to an elegant entry. Inside, the building opens into a huge atrium. A clerk is registering guests. A porter greets us with a tray of fruit drinks. “Welcome to Lodge Kura Hulanda,” he smiles, and hands us a cool fruit beverage. And so begins one of our most interesting and enjoyable travel escapades. We spend the next three days trying to find our way to various locations on the island only to get hopelessly lost. Signage on the island is not well done and we have trouble synchronizing what we read on the map with what we read on the road signs. We look and drive and turn around, then look and drive and turn around again. And then, somehow, we find our way. It’s a kind of where-in-heaven’s-name-are-we-OMG-we’re-here experience. It is as if our destination takes pity on us and places itself in our path; it is one of the most fun getaways we have ever had. Weather. It’s hot (and humid), in the mid-80s and occasionally low 90s in October, but we like that. We learned to expect a shower during midday; nothing to slow you down. World Heritage Site. 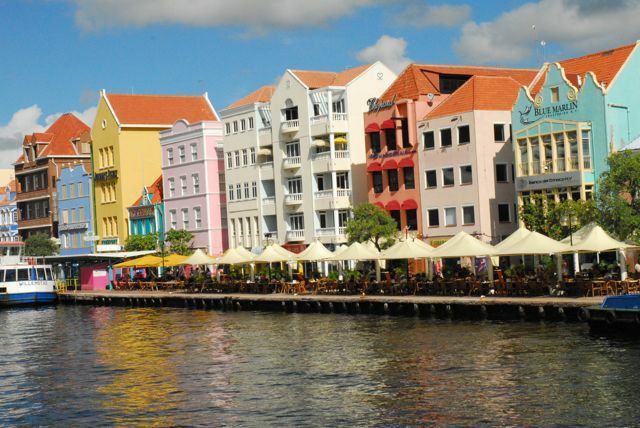 In 1997, UNESCO named Willemstad, the capital, a World Heritage Site for the colorful and unique architecture of its buildings. Based on 17th and 18th century Dutch colonial design, Willemstad’s buildings now incorporate Caribbean touches such as verandas, porches, fretwork, and shutters. No street hawkers. None of any kind. At least not yet. Ok–I know you want to get a coffee or a drink, so I will stop for now. But come back, because I have to tell you about the Sugar Thieves, some restaurants, the Hato Caves, the Pontoon Bridge, the Floating Market, and some more information that I think you will enjoy.